Laundry soap? Why is Lauren Fix reviewing laundry soap? What’s the deal!? 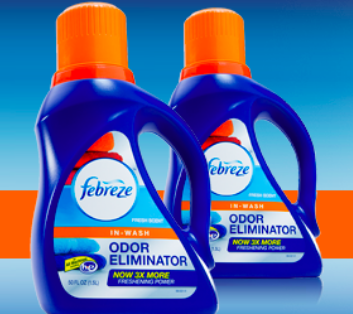 Well, this was a special case because Febreze has just developed an Odor Eliminator that is perfect for washing clothing and laundry with the toughest odors. Ok, again you ask, really Lauren? Yes, really. I work on my cars and restore cars at Fix Motorsports, and getting dirty with tough stains is part of the job. Have you ever tried to get those evil odors out of clothes, or grass stains from your kid’s clothes? How about smoke, sweat, mildew or cooking stains and smells? I decided to try washing two different loads using Febreze’s In-Wash Odor Eliminator detergent. The first load was with clothing worn around the shop and they were pretty dirty from disassembling an engine. The other load was a ton of hand towels from the garage and some dirty throw rugs. The results? From both loads I had fresh, stain-free and odor-free laundry. I’m sure when our son comes home from college with a grimy bag of dirty clothes he claims he didn’t have time to wash, Febreze In-Wash Odor Eliminator will be the laundry soap he will be using, too.